During the 1930s, an estimated 150 California condors lived in the wild. By 1987, that number was down to just 27 birds. Researchers believe that suburban sprawl, sport hunting, and pesticides all contributed to the near demise of this species. In 1987, the San Diego Zoo and Wild Animal Park captured every wild bird still alive and began breeding chicks in an effort to help the species return to a safe level. As you see in Animal Attractions, zoo keepers try creative methods to rear the chicks, such as using condor puppets to feed them so that the young birds never associate humans with food, and thus do not become dependent on us for survival. The Wild Animal Park is reintroducing this species, once thought doomed, into its natural habitat. Dave Rimlinger, curator of birds at the San Diego Zoo, has been monitoring the condors that now reside in the zoological society’s “condor-minium” complex. Here, in an interview with NATURE Online conducted in October, 1997, he describes the condor release program and its goals. You brought wild birds into a captive situation. How have the California condors done in captivity? They do very well. In about 14 years, we have been able to increase the population to over 130 birds. We had been working with Andean condors, which is a pretty close relative [of the California condor], and we worked out a lot of the husbandry techniques with this closely related species. We knew from our experience that we could breed Andeans in captivity, and we knew the different types of enclosures that were used around the world, and were able to design something for California condors based on what our experience was with the Andean, including their diet and that sort of thing. The condor’s wingspan is nine and a half feet. What sort of enclosure does a huge bird like this need? They actually do fairly well in a variety of enclosures. We started off with large enclosures at the [San Diego Zoo’s] Wild Animal Park. They started off 40 feet by 80 feet for one pair of birds, and we built six of those. Over time, we built some additional pens that were 30 by 60 [feet], and then we have actually now bred them in smaller ones — 20 by 40 feet. They can stretch their wings and fly even in the smaller pens, but they seem to breed fairly well in any of those sizes. We won’t go any smaller than that. How many birds are you aiming to keep at the Wild Animal Park? We are trying to build up a captive population of close to 100 birds. The total population right now is over 130, but that includes the birds that are currently in the wild. There are roughly 30 in the wild between California and Arizona. You have been releasing young birds into the wild. How do you decide how and when to release them? A lot of this is experimental, so we are learning as we go along. We are trying to figure out where the best places are for releases back to the wild. There is a recovery team working on this, made up of representatives from the San Diego Wild Animal Park, the U.S. Fish and Wildlife Service, the L.A. Zoo, the Peregrine Fund, and the California Fish and Game and Forestry Services. We all get together and make decisions as a group, and we are learning every day. Every year, we change something with respect to the way we release birds back to the wild. What seems to work best for these reintroductions? The site has a lot to do with it. We look for very high cliffs that have consistent winds. 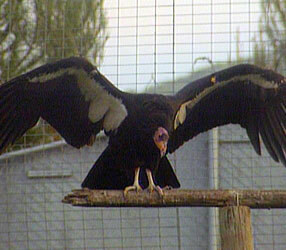 Condors are very large birds and they need consistent wind to get up off the ground and stay in the air. They spend a lot of time soaring, looking for food. It helps to have strong winds. How old are the birds you release? We try to release birds around the age when they would normally leave the nest: around six months, or at least within the first year of age. The reason for that is that they don’t have the flying ability that an older bird would have, and they tend to stay around the release site. That way, they can just learn their surroundings and they don’t get lost. Condors reach maturity at 5 to 6 years of age. How does that compare to the way the birds would behave in the wild? 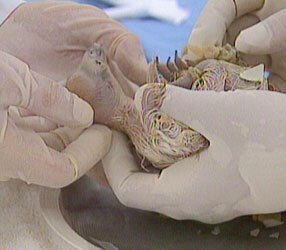 California condors lay one egg normally. The parents take care of that youngster for the six months that it takes for them to fledge [leave the nest], but then actually sometimes for an additional year, so sometimes the chick has the benefit of the experience of learning from the parents. Since they don’t have the benefit of the parents out there, they sometimes get into trouble. They go into areas that we would consider dangerous: too many people, and areas where there are lots of buildings, or lots of power lines. Power lines are a potential threat to condors. They will actually land on them, or sometimes fly into them, because they don’t always see them. So, if they get into areas where we think there is potential danger, we try to discourage them and bring them back in. Sometimes we will re-release them in a different area. Have any of the released birds had offspring yet? No. It takes about five or six years for a California condor to mature, so it will be a while before they will reproduce in the wild. How many birds have you released so far, and are any of these the original 27 birds that you captured in 1987? No. We use the older birds as breeders. There have been a few more than 30 birds released, and actually by the time of the NATURE show [in November 1997], there will be another five birds or so released into the wild. Within a few weeks of the airing of the show, there will be up to 10 more birds released. So, this program is constantly changing. Some of the birds that were released have had to be brought back into captivity because they weren’t behaving the way we would like [in the wild]. Do you use radio collars to monitor their movements? They all have radio collars on them. Each bird usually has two radios: a battery-powered radio and a solar-powered radio. They last one to two years, and we are still trying different types of transmitters and technologies. We have biologists out in the field seven days a week tracking the birds. Is it wise to release California condors into the same region where they nearly went extinct? A couple of things that are considered threats to condors are believed less so nowadays. One is DDT [a pesticide now banned], and another is shooting. Condors are big easy targets, but we don’t think that is as big of a risk as it was in the early 1900s. What has happened, though, is that people are out there hunting, so there is a lot of potential carrion from animals that are shot and not retrieved. Condors will eat a dead deer if they find it. 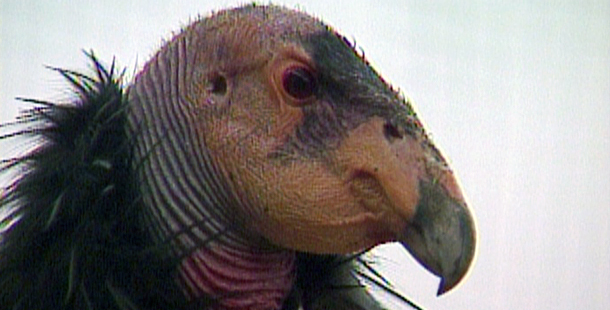 The problem is they can ingest lead [from the bullets], and lead poisoning has been a problem with condors. It only takes a small piece of lead to cause poisoning. What can you do to minimize risks to the birds? We are trying to educate people that would frequent the areas where condors have been released. We know where the condors range on a daily basis. There is hope that we won’t always have to be breeding birds for release. That is the goal of this recovery program. It is looked at as a last measure. Do you have any last thoughts for our online visitors? We fully pay for the captive project here in San Diego with the dollars that come from our visitors that come through the front gate, but they won’t be able to see condors on exhibit at the zoo and Wild Animal Park. We someday hope to have birds on display, and we are confident that we can breed the birds on display as well.